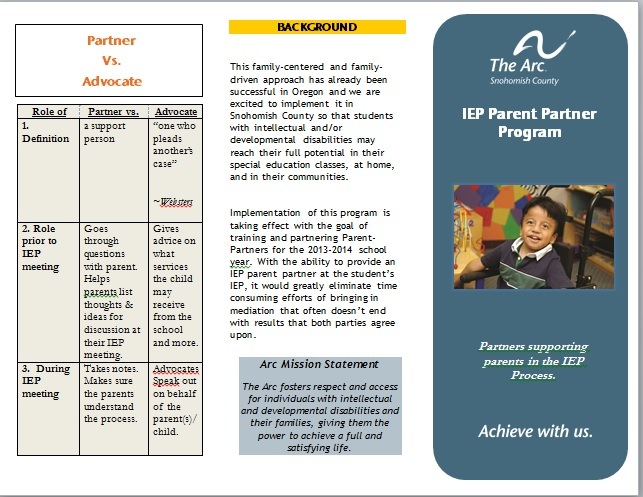 What is the IEP Parent Partner Program? The IEP Parent Partners Program is a program that trains and matches IEP Partners with parents wanting support at their child’s IEP meeting. Who are IEP Parent Partners? IEP Partners are parents & others who have gone through an IEP Partner Training Program. IEP Partners are volunteers for the Arc of Snohomish County. They receive a stipend for each IEP meeting they attend on behalf of The Arc.